This great classroom kit contains materials for making 40 traditional Cherokee double wall baskets, each measuring approximately 6" wide × 4" high (15 cm × 10 cm). Traditional two-tone construction is made with #2 round natural colored reed and #2 smoked brown reed, which is frequently used by Cherokee weavers today. 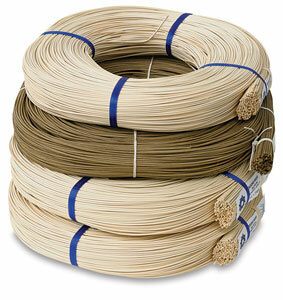 The Cherokee double wall basket is known for its strength and durability, due to the two layers of weaving. Illustrated instructions are included. This is a fun and rewarding project for teachers working with students at high school level and beyond. ™ V I Reed & Cane is a trademark.